How to get the updates of all the softwares in the systems? | Free Tools to get the automatic updates in the system. We download many softwares from the net to use them and we forget to update them. We lose the advanced options of those software new versions. So there are many tools to show the updates of the softwares that we are using, the list of softwares as follows. Software update monitor (SUMo) is another tool with easy interface. We can download it from the SUMo link in the sponsored free software. We should install it and run by clicking on the shortcut on the desktop. The window will open with the options scan, add, remove, ignore, and get update options. We can get the list of softwares by clicking on the scan option and we can the updates by clicking on the get update option. We can get the links of the updated software and we can get the list of the softwares in the form of text file and excel file by tools-> export-> text file option in the menu bar. We can have the list of softwares in the left side and the details of these softwares in the side column. For example if we select the adobe flash player, we get the details like company name, homepage and version. There are options like up-to-date, refresh, unknown, not supported, new version available in the tool bar. We can know the details of the updates by selecting the up-to-date option and we can set the time for the updates by the options tool in the menubar. We should download the downloadappsanp tool by clicking on the download option in the link. We should double click on the short cut in the desktop and run it. It scans the applications in the system automatically. There are many options like download, install, upgrade, update, reload, report bug in the left side of the window. We should check the software and click on the update button to get the updates. We can delete the unwanted sited by clicking on the upinstall option. The update notifier is the tool which requires less memory and it scans to give out the list of the softwares in the system. It shows the update details of the softwares in the updates window. For example, if we are using the firefox browser, we get the details of the version, publisher etc. if we click on the green arrow, we get the latest version download. 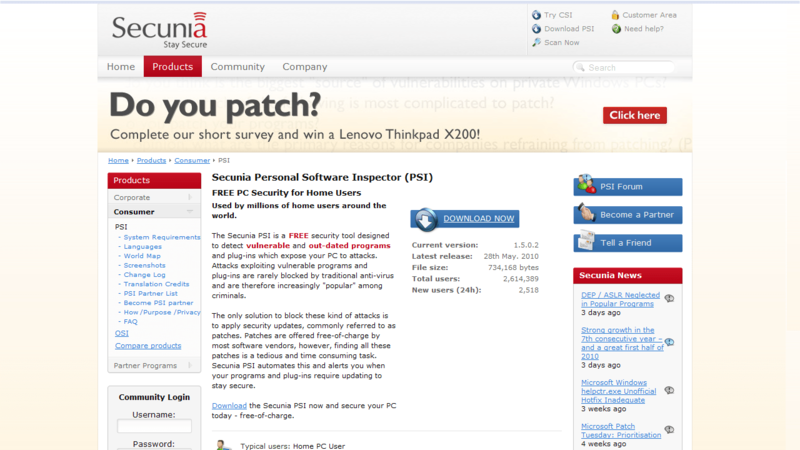 We should install the Secunia Personal Software Inspector to inspect the system. There are options like overview, insecure, end-of-life, patched, scan etc. with the scan option, we get the list of the softwares in the system and we can update the latest versions from the patched tab.